All County Surveyors & Planners, Inc.
All County Surveyor’s & Planners, Inc. is currently located in Sandy, Oregon and has been providing civil engineering, professional land surveying, water rights, and land use planning for over 23 years. The company has designed projects throughout Oregon, Washington and Nevada. The company is owned by Dale Hult PLS (professional land surveyor), WRE (water rights examiner), who has been designing projects and surveying for over 35 years. 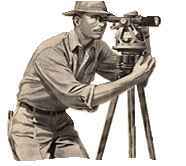 All County Surveyors & Planners, Inc. is a reliable firm with quality staff including both licensed professional land surveyors and professional engineers. Our staff is trained to work hard for you and communicate clearly. Projects have at least two professionals review (including a professional land surveyor) them prior to leaving the office. All plans and contract documents are stamped by the engineer or land surveyor in charge. We always provide FREE ESTIMATES...give us a call or fill out the form on the Estimates page. See our special offer page for details!